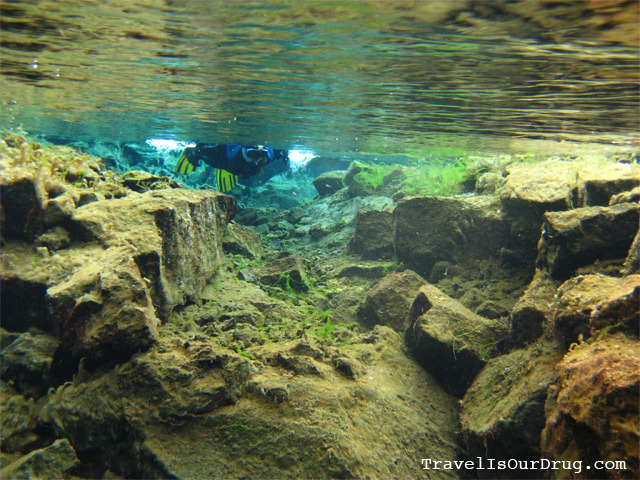 Today was the day we had been waiting for, for WEEKS – ever since I booked us for the snorkeling tour of Silfra. 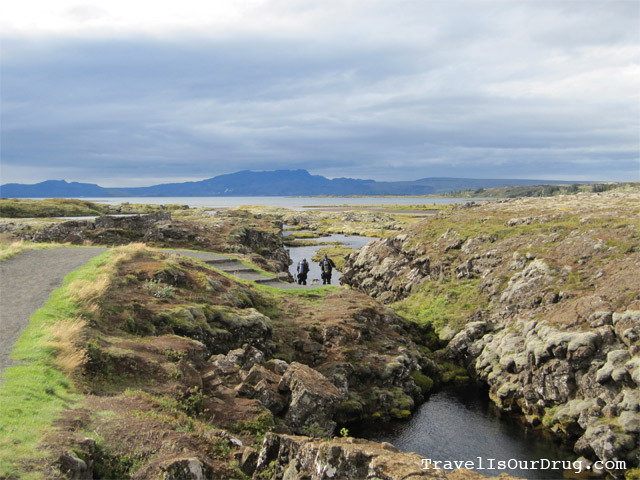 Our guide picked us up around 8:00 and we started out for Þingvellir National Park. 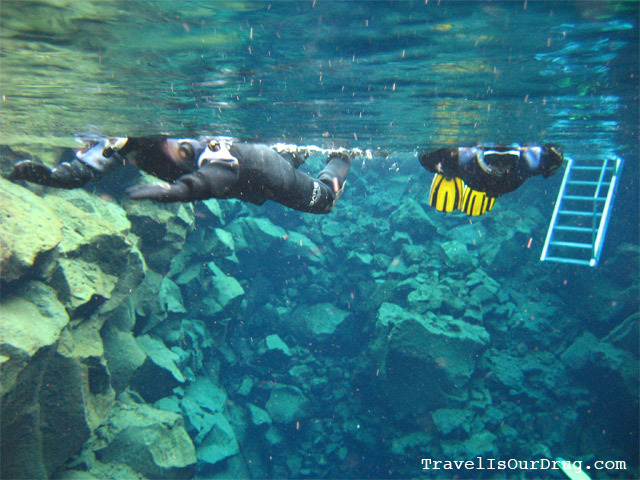 When I first found this excursion, I was SO excited about the idea of snorkeling in Iceland. K, however, knowing my paralyzing fear of having my face in the water, was hesitant to commit to it because he was afraid I would freak out and not go through with it. 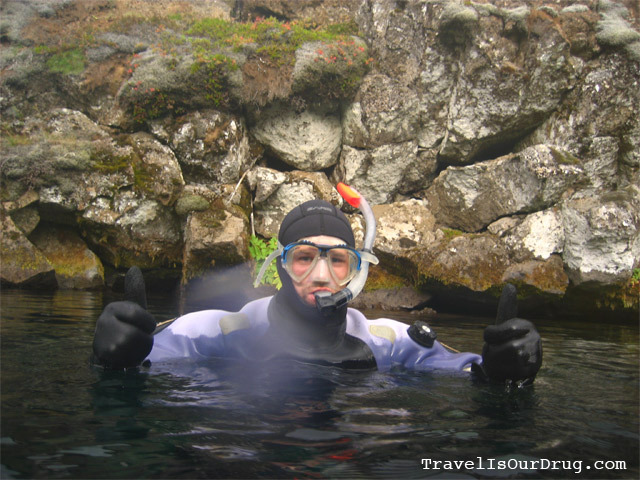 I have to admit, when he first reacted, I was slightly annoyed – I mean, it’s snorkeling in Iceland. Of course I’m going to do it! 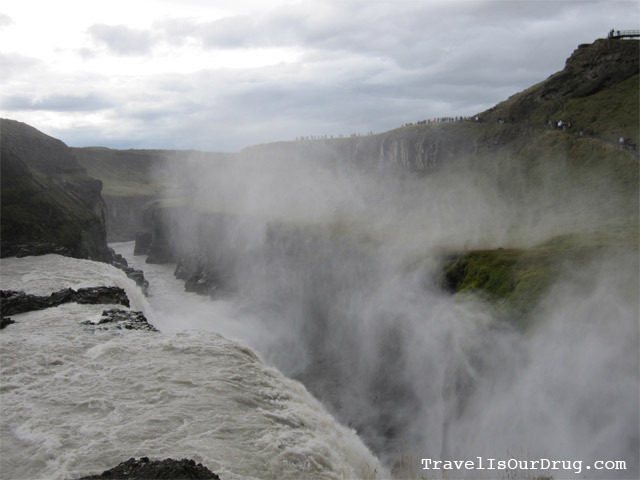 – but as we headed out into Þingvellir this morning, I was starting to feel pretty nervous. All the way up until the second I put my face in the water, I wasn’t sure if I would be able to go through with it. But I am happy and proud to say that I did it! We did our snorkeling and Golden Circle tour through Dive.is and had a fantastic time with our guide and divemaster, Aron. We arrived in Þingvellir around 9:00, hopped out of the van and started suiting up. 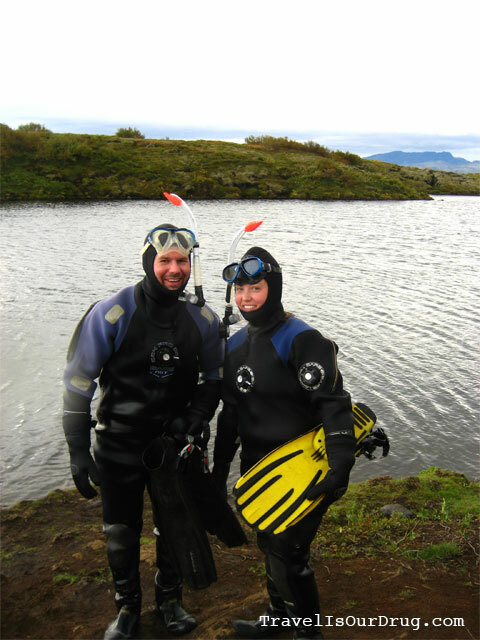 The water is only ~2°C (~36°F), so we were in some heavy duty clothing. Layer 2 – zip-up, full-body down suit; this was really comfy and warm and made us super buoyant when we got in the water. Layer 3 – dry suit; this was ridiculously difficult for me to get into and walk in because they are built for men with no hips and ginormous feet. I barely stuffed my curvy hips in there and then kind of waddled around because I couldn’t pull it up far enough to get a full range of motion in my legs; not to mention the huge, floppy shoes on the end. It was awkward. And I nearly had a panic attack trying to stuff my head through the neoprene gasket on the neck – especially when you have to be overly careful not to tug and rip the material – yikes! I had a mild moment of claustrophobia standing there all suited up with limited mobility and gaskets sealed around my wrists and neck. It took some strong willed determination to prove K’s concerns unjustified (I was not going to flip out and bail now!) and to get me back in control and down to the water. When we were done suiting up, all that was showing was our faces, much of which was eventually covered by our masks. 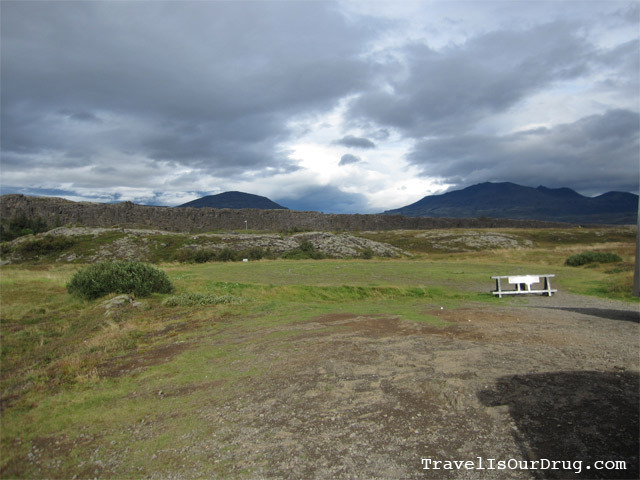 We hiked (I waddled) down to the entry point to Silfra. Aron threw down our flippers, strapped us into them, got us set with our masks and down the ladder we went. Into FREE-ZING cold water! As I sat there, treading water, waiting for Aron to get in, I started to feel mild panic again – Was I really going to be okay with this? The water was COLD and I really, really, irrationally fear having my face in the water. I was starting to think maybe K was right and I was just going to float on my back all the way down this crack. But in the end, my stubborn desire to prove to myself that I could do it won out. I stuck my face in the water and was absolutely amaaaazed at what I saw! I pulled my head of the water to scream, “This is awesome!” But it came out as a big garbled mess because my lips were frozen around the snorkel! Holy crap was it cold! I guess maybe I should backtrack a little and explain that Silfra is a rift between the North American and Eurasian tectonic plates. 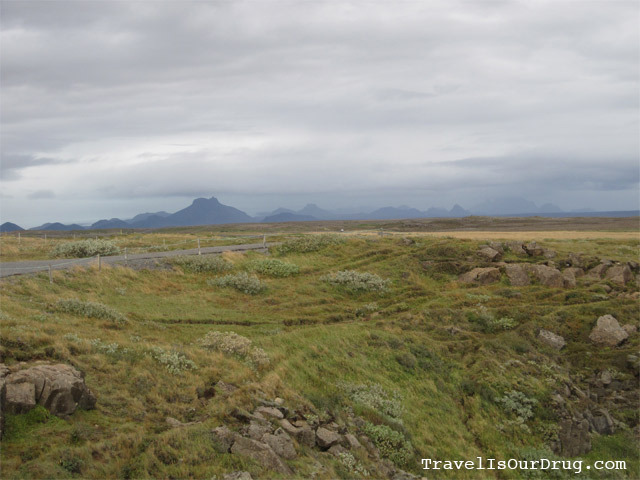 From the parking lot where we started, we were looking at the North American range of mountains (atop the NA tectonic plate) in the not-so-far distance. Just under the mountain peak was a flag that represents the place where the Viking Council used to meet – the first parliament on record. Behind us was the Eurasian range at quite a distance. Many years ago, these mountain ranges were butted against one another. 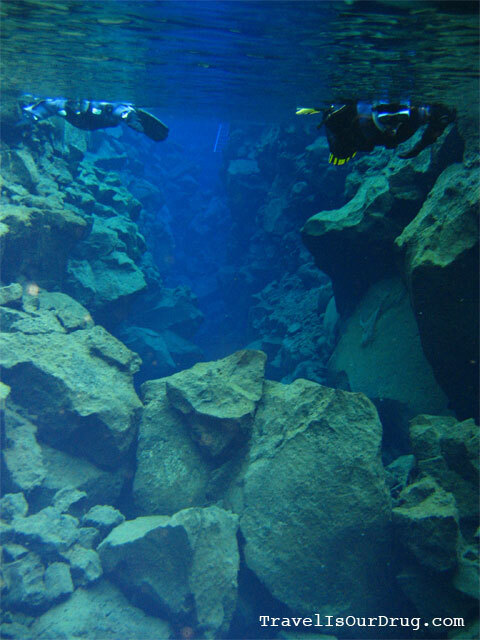 The plates are gradually moving apart by about 2 cm each year, and the resulting chasm is filled with lava-filtered, pure water with unbelievable visibility. 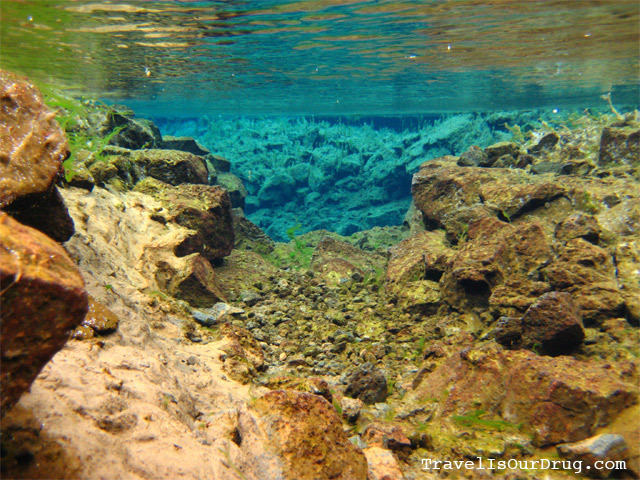 The water filters down from a glacier, each drop taking 30-100 years to travel from the glacier, through the lava, and into Silfra. 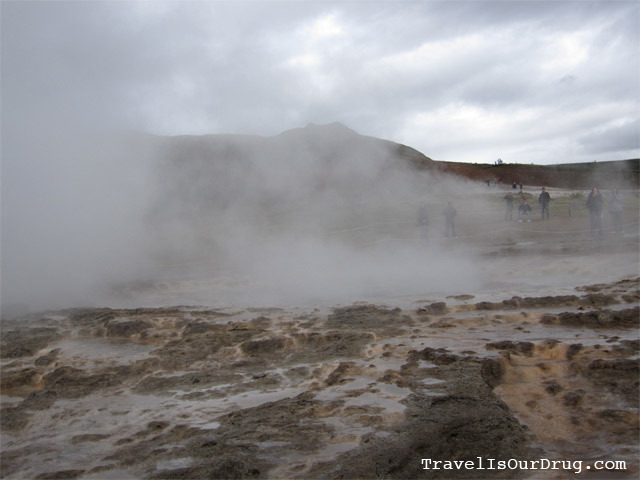 Because of the lava filtration, the water is incredibly clean and drinkable (again with the Icelanders being extremely proud of their pure, drinkable water), which is good news when you have your face stuck under it for a prolonged amount of time. This was such an amazing, surprisingly calming experience. I was blown away by the overwhelming feeling of tranquility that pulled me in. 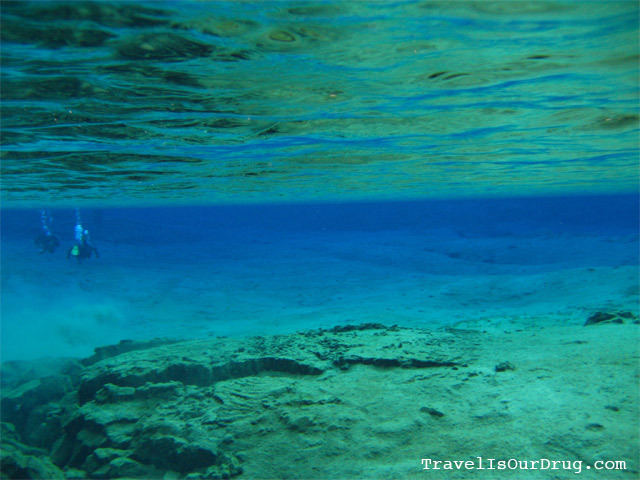 The only sounds I could hear were my own breathing and the splash of my flippers behind me, as my eyes scanned all around me – up, down, in all directions – all I could see was pure, blue, translucent water and the awesome geological formations and algae along the way. We swam from deep, narrow passages into wider, shallower passages where we could almost crawl through on our hands. And then the bottom would drop out again, leaving me breathless. At some points, I would reach my hands out, expecting to touch the rocks along the edge. 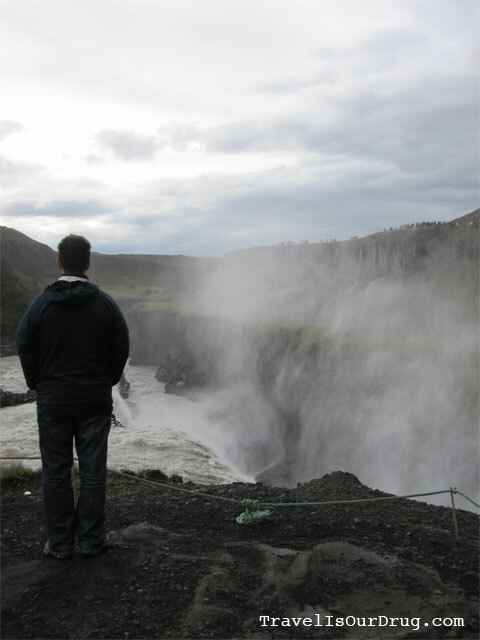 When I didn’t reach them, I’d take my head out of the water to find that I was still 3 meters or so from the edge. That’s how clear the water was! 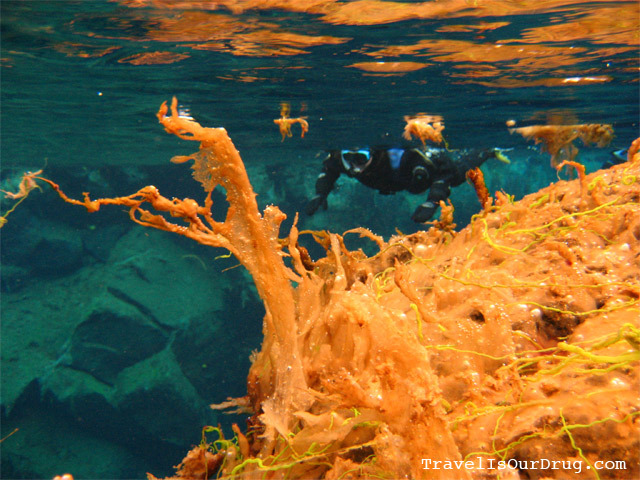 There were no fish or wildlife in the water, but there were several types of algae growing on the rocks – some that looked like grass swaying with the current, some bright orange that looked a bit like pumpkin guts, and some bright green like springtime grass. One of the coolest parts was the section they call the Cathedral. 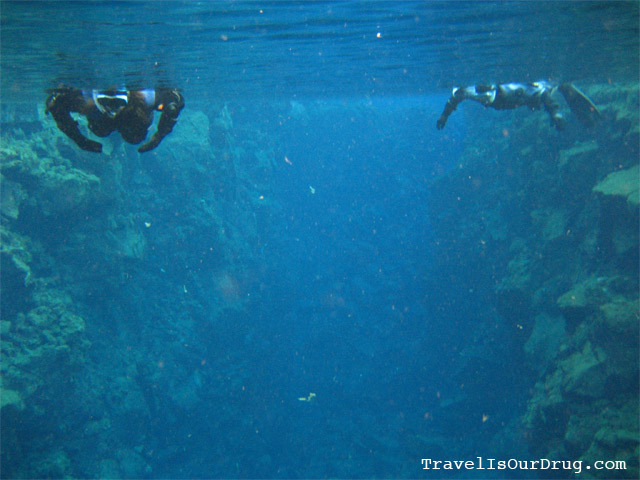 At this point I wished I was diving, as they were able to go alllll the way down to the bottom – 65 meters down. 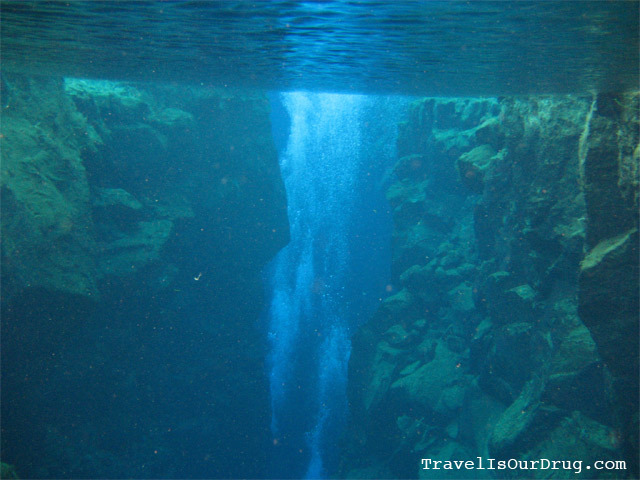 We peered down from the surface into a deep rock crevice that ended in a deep, dark blue. I was amazed how far we could actually see down into the crevice. 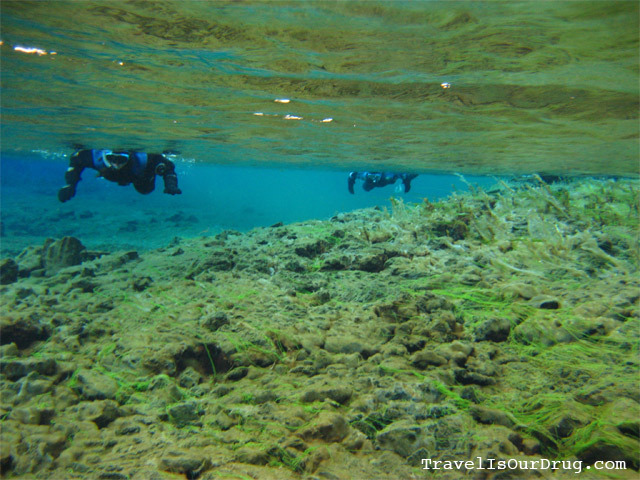 The last part of the snorkeling was the Silfra lagoon. 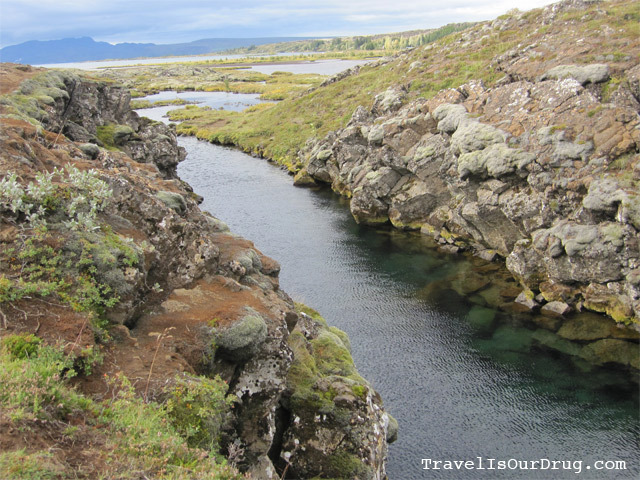 To avoid being swept out by the current into the lake, we made a hard left, crawling on our hands through to the Silfra lagoon. From the shallow rocks and algae, we turned into a long, wide sandy lagoon. I looked straight ahead of me and could see Aron not too far ahead of me – or so I thought. After swimming and swimming and still not reaching him, I finally took my head out of the water to realize I was only about 1/4 of the way across the lagoon and he was at the end where we climb out. The water is just SO clear I could see him like he was right in front of me. It was so disorienting and totally cool! 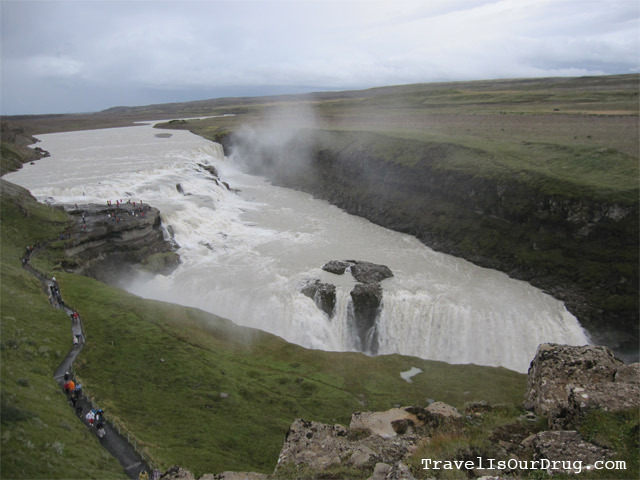 At the end of the lagoon, we climbed out – slightly bummed that it was over and ready to start all over again. We hiked (I waddled) back to the top of Silfra where we’d started just about 30 minutes earlier and jumped off of the cliff at the head of the crack. I have to say – after my incident with the broken tailbone at Rick’s Cafe in Jamaica – I was a little hesitant, but finally took the plunge. 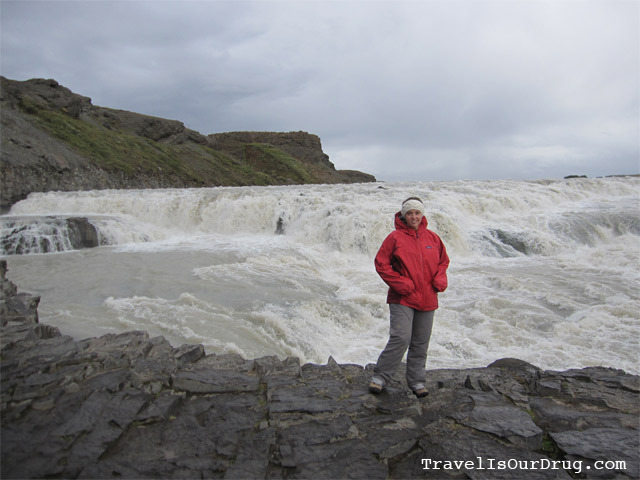 The down suits made us so buoyant that my head barely went below the surface before I shot back up to the surface screaming, “That was AWESOME!” K jumped a few times and then we headed back to the van to get changed and move along to Gulfoss. Our first stop once we arrived was the small cafeteria just off the parking lot. We’d packed sandwiches for lunch, but it was cold and overcast, I had wet hair, and I really wanted something warm. The cafeteria had a variety of hot and cold dishes and drinks for a decent price, considering it was a tourist spot. 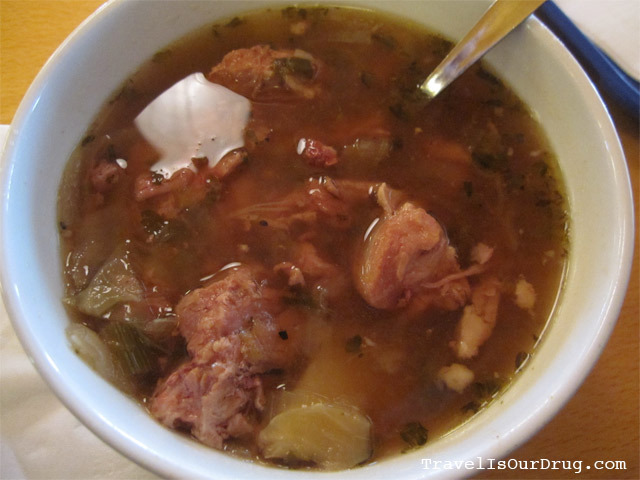 We had an amazing, delicious lamb stew with tons of veggies that took the chill right out. 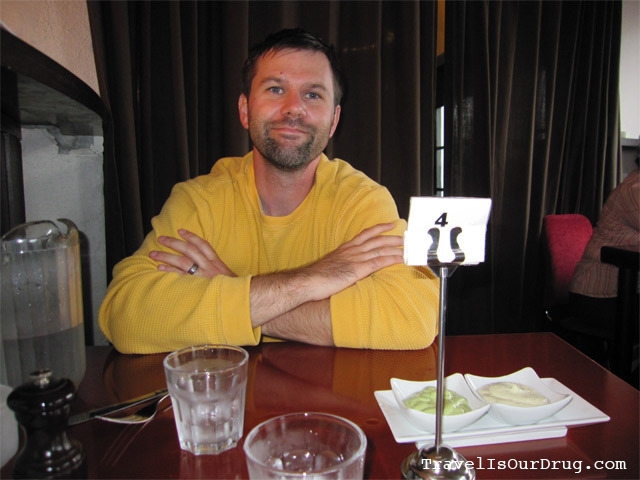 While we were eating, we ran into Steiner – our guide from the 4×4 trip yesterday. He was heading into the interior with a group for a 3-day tour, and I so badly wanted to ditch our plans for the rest of the day and head out with him. 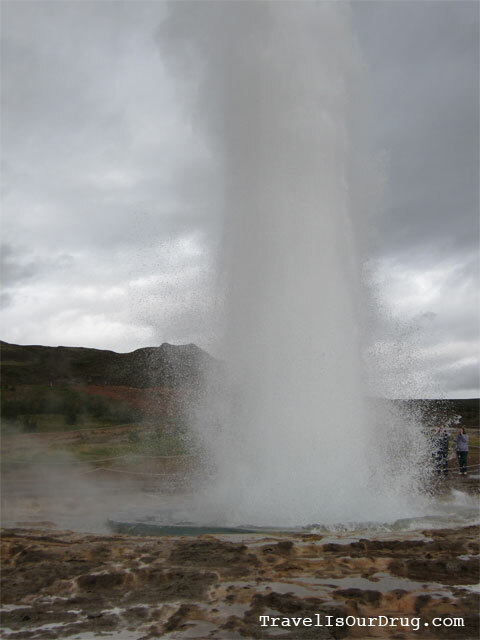 There’s no doubt that K and I will have to make another trip to Iceland at some point to finish what we’ve started. After eating, we walked down to the waterfall. 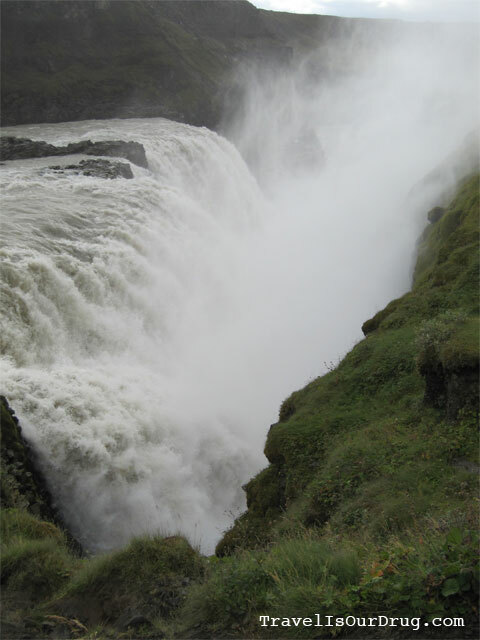 The water flowing over this double-tier fall was so powerful, and so voluminous – it was pretty unreal. That delicious lamb stew didn’t stave off the chill for long out there, as the wind whipped through and picked up mist, throwing it in our faces relentlessly. 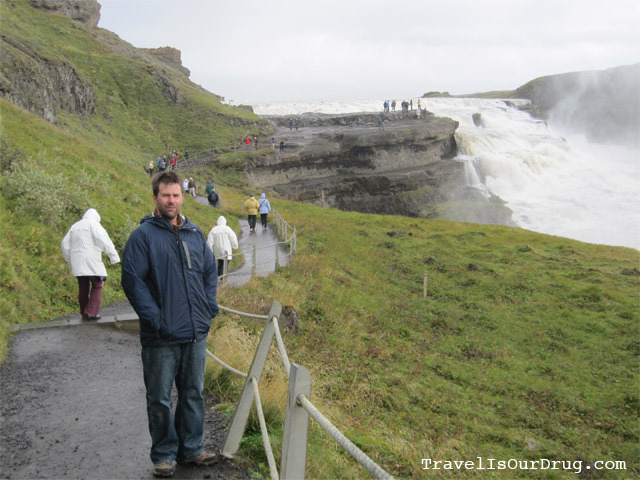 Still, we climbed down a couple of slippery, treacherous staircases and followed the trail along the lower tier of the falls, up and onto a rock platform that jutted into the second tier of the falls. 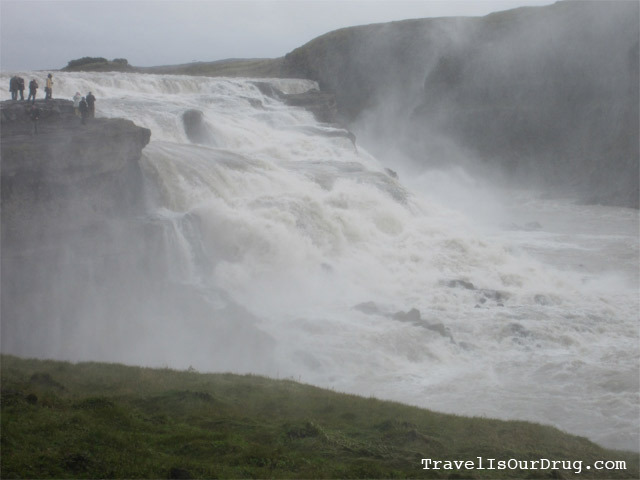 As I stood there taking in the sheer volume of water thundering over the fall, and the mist spraying me in my face before traveling off and evaporating into the distance, I was reminded once again of the overpowering feeling of fear and reverence I have for the natural force of water. It scares the crap out of me, but just completely amazes and entrances me at the same time. We walked back up the trail and up to a view point on a cliff above the fall to get a different perspective of the monstrosity and to try and fit the whole thing into one photo. 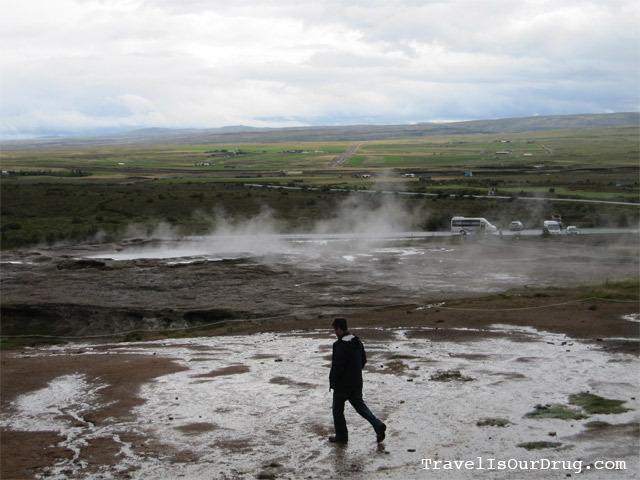 Back to the van, and we were on the road to Geysir. 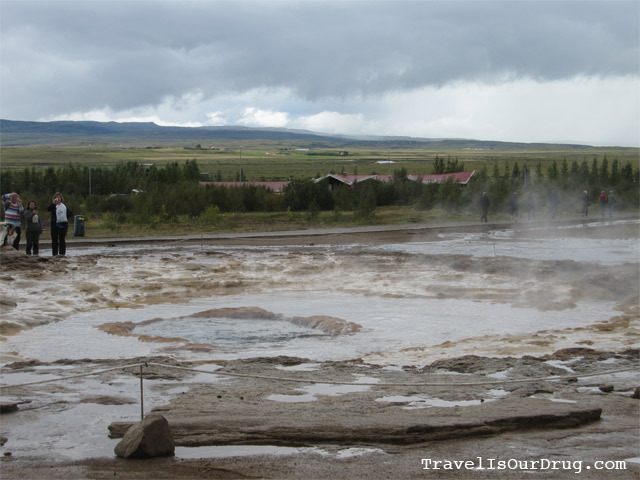 Geysir is a flat, open area with quite a few geysers. 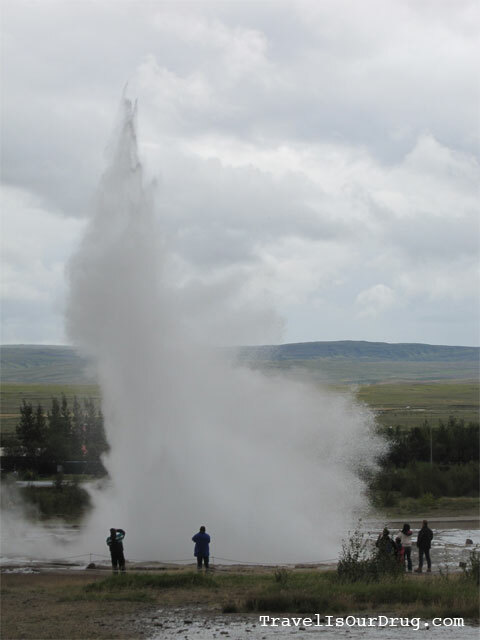 The original geyser (named Geysir) that gave the area it’s name is dormant now, but we were able to see Strokkur blow 3 or 4 times while we stood there. It was awesome to watch a large bubble form on the surface, and almost immediately explode, catapulting water 30 meters into the air. The burst was so quick, you could blink your eyes and miss it. (It took a couple of tries before I was even able to catch it with the camera.) 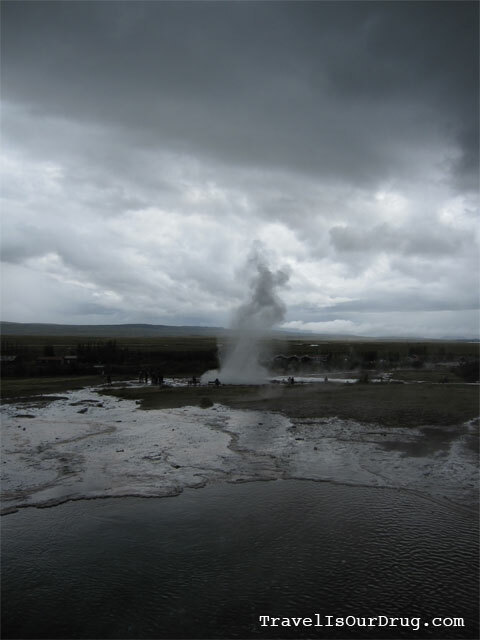 And then the area was still again – the steam trailing off into the distance the only evidence of the volatile explosion. It was captivating, and despite having watched it erupt several times, I had a very hard time walking away. 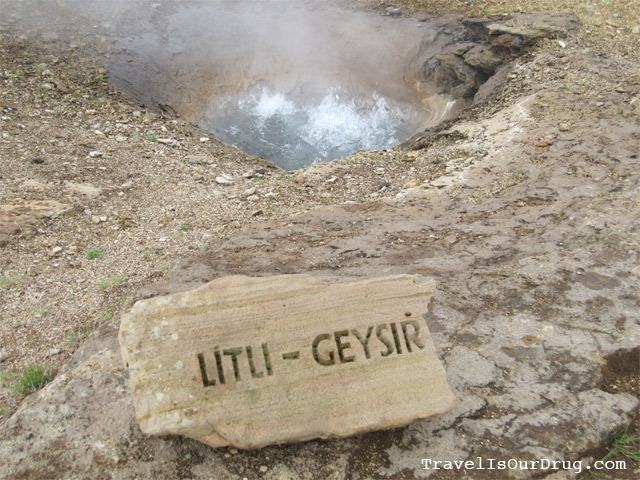 Also in the area were several smaller geysers – a couple that just bubbled on the surface like a pot of boiling water, and one that was just a pitiful little jet spitting out of a hole in the ground only a few centimeters wide. 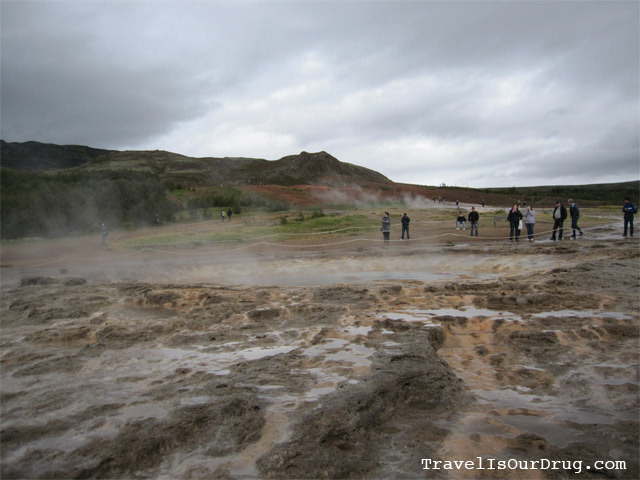 The ground was a muddy mess of red clay and stinky sulphur water streams, and off in the distance were the gorgeous mountains in Þingvellir. 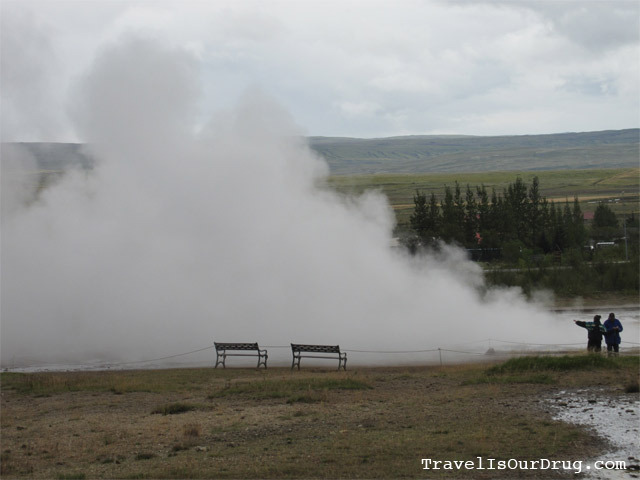 We left Geysir and headed back into Reykjavik. K and I were both so exhausted we dozed off most of the way back. I tried so hard to keep my eyes open so I didn’t miss a single thing around me, but my lids just got heavier and heavier until I just couldn’t resist anymore and let them close. 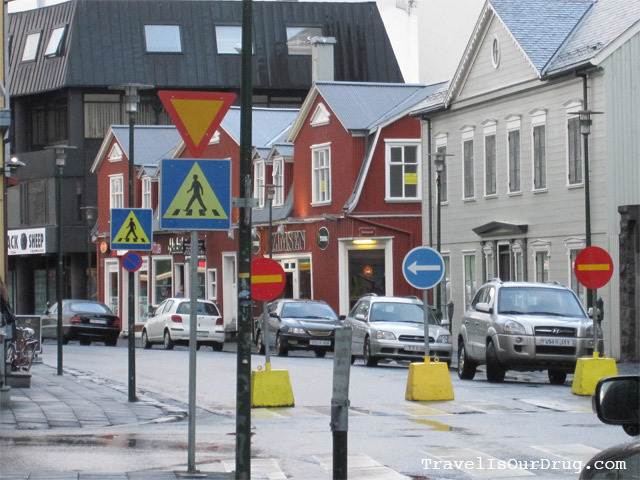 After the shopping spree, we wandered around Reykjavik. I love, love, love the artsy feel of the city and the fact that we could walk the entire city. 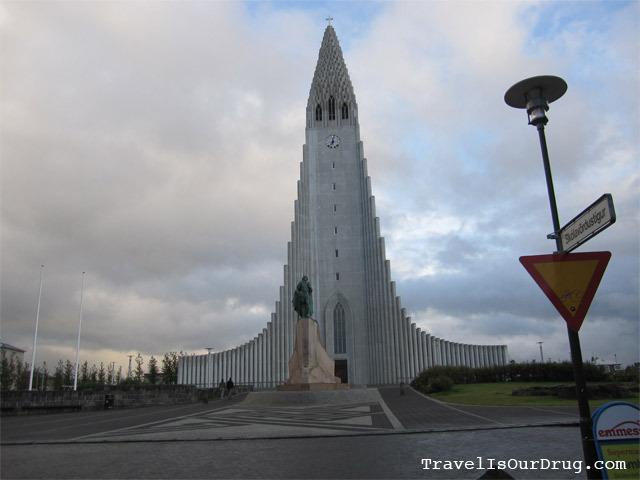 We wandered down to Hallgrimskirkja – a Lutheran church, which is the tallest building in the city and somewhat of an icon of the city. 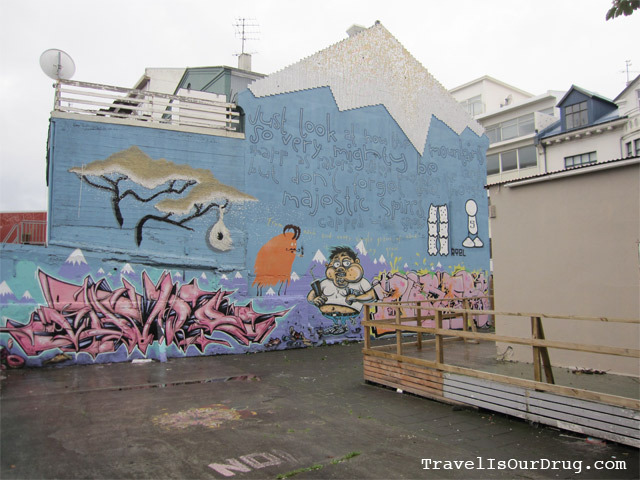 We walked the streets just taking in the atmosphere, admiring the colorful, humble city homes, the babies cozy in their zip-up bundled buggies, the full-wall murals on the backs of homes and businesses, the different street signs that add color and confusion at every turn. 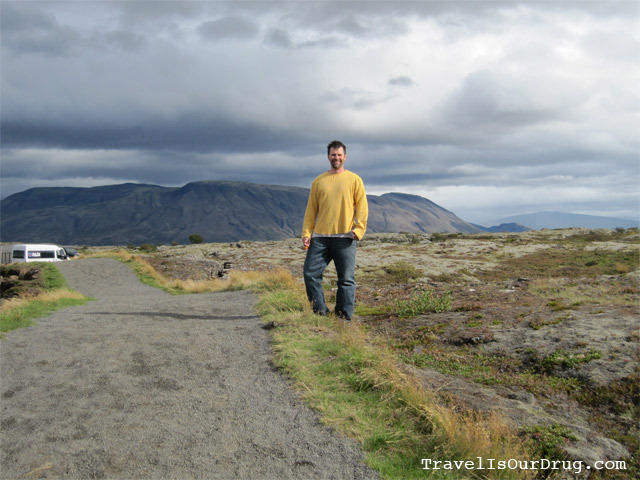 I was so consumed by the artsy, laid back, intimate feel of the city that I just want to stay longer and revel in all that Reykjavik – and the rest of Iceland – has to offer. As we wandered lazily, holding hands and idly chatting about whatever came to mind, I kept thinking that I could really see us staying in this city for a while. I feel so giddy here I just can’t imagine leaving tomorrow. 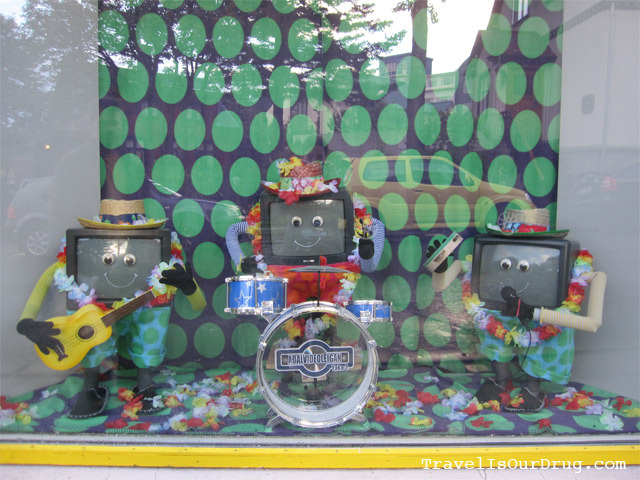 Which is really odd since we’re headed to Amsterdam next – somewhere I never expected I’d be hesitant to head toward. 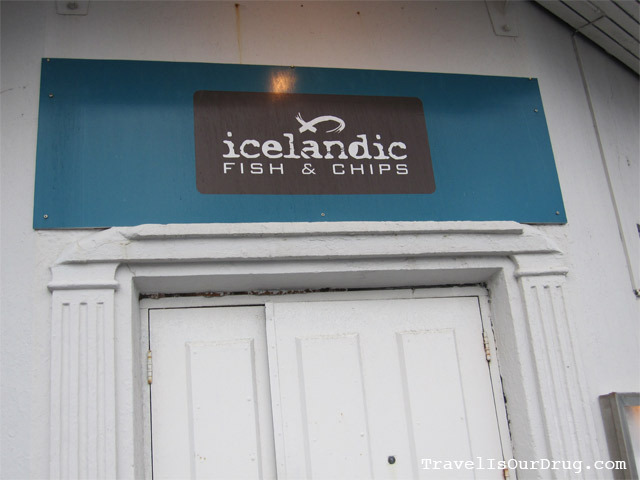 Our wandering ended a few hours later at Icelandic Fish & Chips. Thank God. They were open this time, too. We walked into a quaint little nook with worn hardwood floors, four tables and a counter to order. 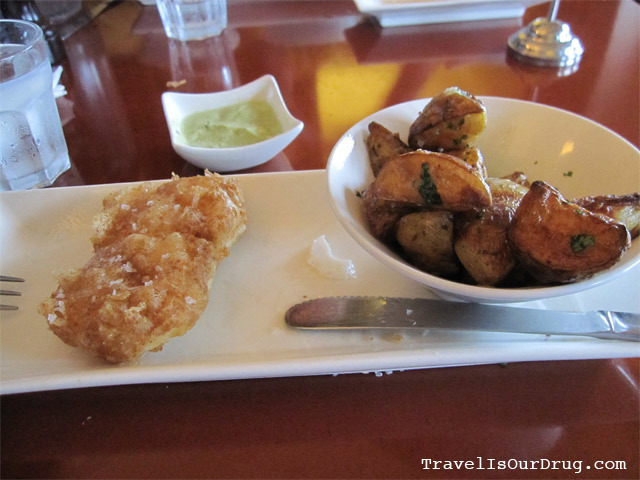 We took a look at the menu and I settled on haddock with basil and K decided on Cod. We took a seat at a small table with a good view of the sea and waited. I was surprised when our food came out to find that the haddock I’d ordered wasn’t what I was expecting. It wasn’t fried, but boiled. I took a couple of bites and just wasn’t digging it. Lucky for me, my husband is a human garbage disposal and eats anything, so he graciously traded me his fried cod for the less-than-delicious haddock. (Just one of the many reasons I love him.) The “chips” were my favorite part. They weren’t fries, but roasted herb potatoes. Yummy. The food was really good. (Well, not the haddock, even though K insists it was. Liar.) There really was no service to speak of. We ordered our food at a counter when we walked in, got our own drinks and they brought our food to the table. But the food came out quickly. The only down side is that it was a bit more expensive than I was expecting, but I guess that’s how most places are here. In terms of Icelandic standards, it was an affordable, delicious meal. After dinner we headed back to the apartment, packed up our bags and climbed into bed to watch TV for a bit before sleep. Tomorrow is going to come super early if we’re going to make it to the airport in time for our 7:30am flight. Today was an amazing day. 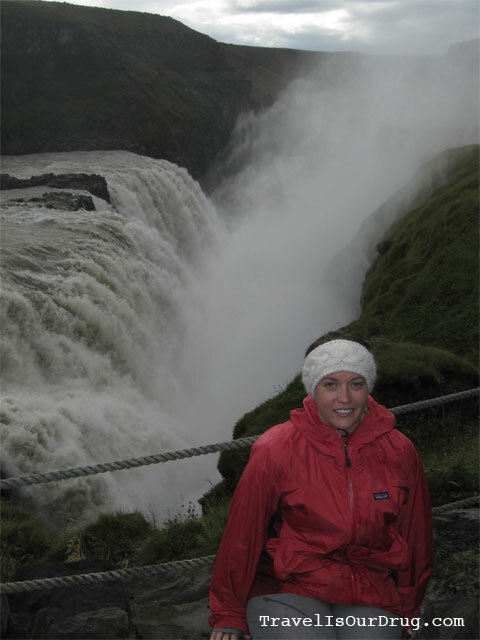 I’m sad that this is our last night in Iceland, but admittedly ready for some warmer weather.